Reference number for this case: 3-Oct-54-Marcoing-2. Thank you for including this reference number in any correspondence with me regarding this case. Miss Perrut was leaning out of this window when she saw "the object". Col. Roux, from Lille, interrogates the gendarmes who saw the saucer. The inhabitants of Marcoing, close to Cambrai, ensure that they were not dreaming. A saucer evolved for 10 minutes in their sky, the other evening, starting at 08:45 p.m.. The main witness cannot be suspected. 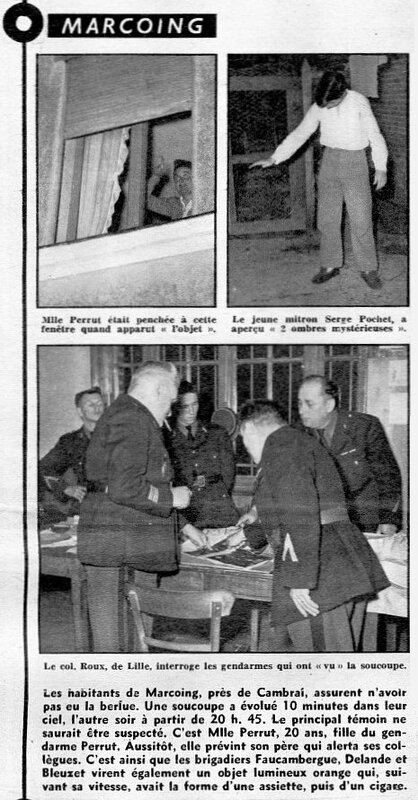 It is Miss Perrut, aged 20, the daughter of gendarme Perrut. At once, she warned her father who alerted his colleagues. Thus the sergeants Faucambergue, Delande and Bleuzet also transfer an orange luminous object which, depending to its speed, had the shape of a plate, then of a cigar. Jimmy Guieu reports that on October 3, 1954, at 08:45 PM., in Marcoing, Miss Anne-Marie P., daughter of one of the gendarmes of the brigade of Marcoing, saw a very sharp gleam through the window of her bedroom. She noted that within less than one kilometer of the gendarmerie, above the wood of Couillet, there was a "very large ball of fire" below which there was another "ball" of a smaller diameter. The ball underneath was swinging under largest like a nacelle, the whole remaining at a fixed position in the sky. Miss P. then alerted her father the gendarme, who initially refused to believe her, but ended up accepting to come to check in person. To check that he was not victim of a hallucination, he then alerted his colleagues and their families. Twenty people then contemplated the phenomenon in bewilderment. The gendarmerie then alerted cyclists who came from Masnières and went to Marcoing and it was then more than thirty people who observed the phenomenon. The two balls remained almost motionless during a quarter of an hour at approximately 500 or 600 meters of altitude while moving vertically every now and then. Suddenly, they changed into a kind of elongated cigar shape. The elongated shape then moved horizontally almost until it was lost from sight, then returned to the initial location, now offering the silhouette of a spinning top. The phenomenon then definitively disappeared towards the South-west in the direction of Villers-Plouich and a sharp gleam persisted for quite a time in the sky. Jimmy Guieu adds that the thirty five to forty witnesses were all the same puzzled that ten minutes afterwards, a plane came to fly in circles above the sector, of which he says it is considered a strategic sector. Aimé Michel notes a sighting in Marcoing, 50 kilometers South of Lille, on October 3, 1954, at 08:30 p.m..
Further in his book, he explains that in Marcoing, 60 kilometers in the south of Chéreng, on October 3, 1954, at 8 p.m., Miss Anne-Marie Perrut, daughter of a Gendarme of the Marcoing squad, was at her window at the Gendarmerie house when she noticed a luminous object, motionless in the sky, at a few hundred meters from her, above the Couillet wood. The object was circular and of orange color. Slightly below this object, as if it were suspended to it, there was a small luminous patch, oscillating. Miss Perrut watched it for a while, doubting what she was seeing, then called her father who first did not want to come. After several minutes, as the object was still there, Anne-Marie Perrut insisted so much that her father finally came. He too started to wonder whether he was hallucinating because he too was seeing the object. Mr. Perrut alerted his colleagues, Gendarmes Faucambergue, Delande and Bleuzet, and their families, and soon there were 20 witnesses. After hesitating, but as the object was still above the Couillet wood, the Gendarmes looked for more witnesses, and stopped people riding bicycles in front of the Gendarmerie house and the small village of Masnières 3 kilometers in the East. All watched the same phenomenon. The luminous ball did not go away, it only sometimes appeared to move slightly up and down vertically. After 08:30p.m., the object suddenly changed: the light suspended in [sic, below?] the ball disappeared and the ball took an elongated shape, like a disc or a cigar seen from a side. Then almost immediately, it moved away horizontally a first time, taking a crescent shape as if the disc had bent, then it came back at the initial position, stayed there a little while, then moved away at high speed towards Viller-Plouich, a village 6 kilometers in the South-West, where it disappeared while throwing a strong light that still illuminated the sky several seconds after it had disappeared. It was now 8:45 p.m. The investigation by the Gendarmes showed that the object was seen by numerous witnesses at the time when it had arrived, from Iwuy, Escaudoeuvres and Noyelles-sur-L'Escaut, three villages located on a line in the north-north-east of Marcoing, at respectively 16, 13 and 3 kilometers away from Marcoing. The object came from the North, the direction of Chéreng, 60 kilometers away, where the 7:20 p.m. sighting had occurred. Aimé Michel insists that the interest of the case rests with the large number of witnesses in several independent groups who all gave the same details, and the great care of the Gendarmes in their report, as they are used to report precise facts without subjectivity. Among the details was: the object, depending on its moves and position, presented shapes of a circle, of a cigar, of a plate, and its luminosity had changed according to its speed. The gendarme said the object had been at an altitude of 600 or 700 meters. b) a low-size object that witnesses saying their were close describe as like circular, hemispherical on the top, changing aspect in the bottom. In the night and in flight, the object is generally luminous, the reddish, orange or gilded top, the lower part likely to emit green, white, red, purple colors, either separately, or simultaneously; the closest witnesses state that, in this latter case (simultaneous emission of several colors), the sources of light are sort of small verticals rods under the object which were seen appearing, disappearing, exchanging between them their colors and thus giving an impression of whirling (for example, October 3, 1954, in Armentières, in Château-Chinon, in Montbeliard, and other dates a little everywhere in the world). Instead of the small rods, under the main object, sometimesappears a smaller object, very luminous, interdependent of the first but likely to go down vertically below him (for example, this same 3 October, in Marcoing, in Liévin, Ablain-St-Nazaire, Milly, Champigny). The author indicates that on October 3, 1954, according to Aimé Michel pages 188 to 196, many witnesses, in Marcoing, Liévin and Ablain, see a strange saucer with dissociation: its lower part separates from the higher part, oscillates, goes down and goes up. "It was circular, and red-orange in color. A little below this immobile object, and as though suspended from it, she saw a small spot of light with a kind of see-saw movement." The father of the witness, a policeman at Marcoing, several other policemen and their families, in all, 20 witnesses, continued to watch this phenomenon until about 8:30 p.m. when the object underwent a sudden transformation, the little spot of light vanishing while the ball took the shape of a cigar and left horizontally. Police estimates the altitude of the object at that time as about two thousand feet. Later investigation disclosed the fact that the phenomenon had been observed over a fairly large area at the moment of its arrival. Jacques Vallée comments that these reports, exceptionally consistent, led to the belief that the object had come from the direction of Chereng, and was possibly the very cause of the sighting reported there a half-hour earlier, and that "all these cases were carefully checked during our four-year investigation of the European files, and there is no question as to the genuine character of these reports. Consultation of collections of French newspapers or direct inquiry to the local authorities will show that we are indeed faced here with original reports that have not been distorted by specialized journals or groups of enthusiasts." Godelieve van Overmeire indicates that in 1954, on October 3 in France, in Marcoing (Nord), between 8 p.m. amd 8:45 p.m., forty witnesses saw two motionless balls of fire in the sky at 500 m of altitude, moving vertically per moment. Suddenly they transformed into a kind of cigar flying then horizontally to return almost as far as the eye can see to the initial place in the form of a spinning top. Long enough after their final disappearance a sharp gleam persisted in the sky. The source is indicated as Jimmy Guieu: "Black-out sur les S.V." - Fleuve Noir 1956 - p. 182. Godelieve van Overmeire indicates that the other version is that "actually at 21:30 the crescent Moon lay down in the south-west. Optical illusion caused by a stratus layer", the source being M. Figuet / J.L. Ruchon: "OVNI, premier dossier complet..." Alain Lefeuvre pub. 1979, p. 657 to 660.
! 1954/10/03 CHERENG + MARCOING + QUEND + LIEVIN ++, FRANCE: Close Encounters with the Moon! Santos wrote that for this case #531 of "various forms" that there was a luminous Unknown Flying Object in Noyelles on October 3, 1954. Dominique Caudron says that at 08:30 p.m. in "Noyelles sue Escaut" [sic], 59, witnesses saw the same phenomenon as in Marcoing; which was in fact the Moon. Santos wrote that for this case #532 of "various forms" that there was a luminous Unknown Flying Object in Escandoeuvres on October 3, 1954. He also listed as case #533 a luminous Unknown Flying Object in Iwuy at the same date. Dominique Caudron says that at 08:30 p.m. between Iwuy and Escaudoeuvres, 59, witnesses saw the same phenomenon as in Marcoing; which was in fact the Moon. He adds that the Iwuy case 533 is the same case. Santos wrote that for this case #534 of October 3, 1954, of "Various Forms" there had been in Marcoing 40 gendarmes observing a luminous cigar. Dominique Caudron says that towards 08:30 p.m., in Marcoing, 59, the gendarmes of the brigade and their family observed an object changing shape above the Couillet wood, which disappeared towards Villers-Plouich. Dominique Caudron indicates that it was in fact the Moon. In 2005, I was contacted by one of the Gendarmes of the Marcoing squad who had witnessed the phenomenon. I will not disclose the gentlemans' name, but I can state that his name was slightly mispelled in the Press sources of the time and of course the mispell was reproduced in all ufology source; this is how I knew the gentleman really was who he said he was. From his statements, it appeared 1) that the description of the event by Aimé Michel is in conformity with his memories; 2) that it was not the moon at all: the object had definitely moved fast at times, on angular distances totally impossible for the Moon. Not looked for yet. UFO reports debunkers generally say it was the moon. [ra1] Article in the magazine Radar, Paris, France, October 17, 1954. [jg1] "Black-Out sur les Soucoupes Volantes", book by Jimmy Guieu, Omnium Littéraire publisher, France, page 182, 1958. [am2] "Oui, il y a un problème soucoupes volantes! ", article by Aimé Michel, in the magazine Planète, France, #10, May-June 1963. [mc1] "Les Apparitions de Martiens", book by Michel Carrouges (aka Louis Couturier), Fayard publisher, France, page 243, 1963. [jv7] "Anatomy of a Phenomenon", book by Jacques Vallee, Henry Regnery publisher, USA, 1965. [jv7] "Anatomy of a Phenomenon", book by Jacques Vallee, Neville Spearman publishers, U-K., 1966. [jv7] "Anatomy of a Phenomenon", book by Jacques Vallee, Tandem publishers, U-K., pp 158-159, 1974. [am1] "Mystérieux Objets Célestes", book by Aimé Michel, Seghers publisher, France, page 153, 1976. [lh1] "A Short List of Discredited UFO Sightings", par Larry Hatch, dans le bulletin d'ufologie The IUFOMRC Newsletter, USA, page 3, septembre 2003. 0.1 Patrick Gross January 17, 2006 First published. 1.0 Patrick Gross January 9, 2009 Conversion from HTML to XHTML Strict. First formal version. Additions [mc1], [go1]. 1.2 Patrick Gross 6 juillet 2010 Addition [jv7]. 1.4 Patrick Gross February 12, 2017 Addition [ub1].